When you first come into contact with Fedor Shirin, a 5-year MBA major and Hampton University tennis player from Russia, he may just look like a tall, athletic, gentlemen, but with further conversation he is so much more. When speaking to Shirin, he goes back to the time when he first came to America. He was surrounded by the loud noises of Brooklyn, New York’s bustling streets, carrying a suitcase with a handle that broke in the midst of him trying to locate the bus to Hampton, Virginia. “I almost got lost… where is the bus station?” Fedor said as he looked for the bus stop to come to his new “Home by the sea,” Hampton University. After a gruelingly long flight from his home in Novosibirsk, Russia, Shirin was more than excited to arrive on Hampton’s campus. The journey to America was a long one for him starting in a suburban town in Russia. “The first time I picked up a tennis racket I was 5-years-old and I became serious about tennis when I was 13.” Fedor described the neighborhood where he grew up. “My brother would tell me stories about our neighborhood. It was a dangerous area, that had drugs and crime,” he said. With guidance from his family, Shirin stayed on the straight and narrow path. While in high school, he was eager to accept a scholarship to come to America and receive an education. With his application to Hampton University he sent video reel of his best tennis matches and was accepted not only to Hampton University, but Hampton’s tennis team as well. 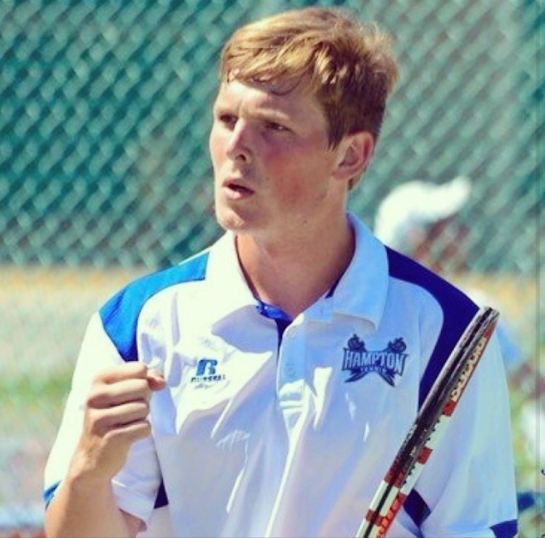 Once on campus, Fedor showed his commitment to the Hampton’s tennis team by playing in nation-wide matches. As the number five best performing player on his team he also enjoys supporting and bonding with his team. Shirin relates to the Hampton student body in more ways than people may know. He has a genuine love for music. “I play the guitar and the piano. I do like Hip Hop as well. In Russia, they tried to have Hip Hop music, but Russian Hip hop is terrible.” The Russian resident assistant at Winona Hall, not only desires to leave his mark in Hampton athletics, but also on through fashion and social media culture on campus. Shirin is the founder and owner of his business “Shirin” which produces handmade custom t-shirts. He describes his business as “… having your own masterpiece, I want to promote uniqueness through my clothing.” Fedor has more projects coming soon with “Shirin, to stay updated follow “Shirin” on Instagram: @brandshirin. Fedor believes the merging of different cultures is an experience everyone should have whether that is his friends back home in Russia or informing others through his YouTube videos worldwide. He is a true testament that learning and understanding a new culture can bring new experiences and understandings.